Don't be alarmed by that "party" in the title. Disney Guilty Party from Wideload Games, announced today at Nintendo's media summit in San Francisco, looks like more than your average Wii mini-game collection. From the developer of Stubbs the Zombie and Hail to the Chimp and published by their new owner Disney Interactive Studios, Guilty Party feels more like board game Clue ported to the Wii. 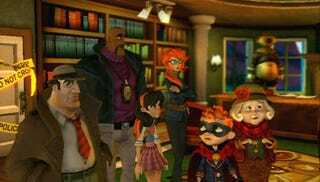 Players will assume the role(s) of members of the Dickens Detective Agency cooperatively or competitively to solve crimes just like real detectives—through Wii Remote controlled mini-games. That involves lock picking, flashlight waggling and, as seen in new screens below, hypnotizing suspects by pocket watch. Disney Guilty Party, unlike many of the other Wii games highlighted by Nintendo today, is due in the second half of 2010.